We’re the single largest o-ring supplier in the intermountain region. HydraPak stocks an extensive range of standard and metric O-rings in a variety of materials and durometer. Materials include: Nitrile (Buna), Fluorocarbon (Viton®), Silicone, EPDM, and PTFE. We stock O-rings for every application—whether hydraulic oil or brake fluid, gases or water, high or low temperature—you’ll find your O-ring at HydraPak. We specialize in sourcing O-rings for the harshest environments and offer unbeatable discount pricing for bulk O-ring sales. In addition to standard inch and metric sizes, HydraPak can quickly produce vulcanized non-standard O-rings with large diameter capabilities and short lead times. 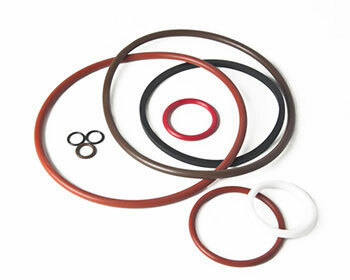 We provide the best vulcanized bond on the market for non-standard O-rings. Virtually any custom design can be created to meet the challenges of your application. We can engineer and manufacture any non-standard sized cross section or inside diameter that is not included in the AS568/400 Series. Worried about tooling charges? No problem. We charge zero setup or tooling fees for your non-standard O-ring. Ordering is easy—shop inch sizes here and metric sizes here. Contact us any time if you have questions or would like a quote on non-standard O-rings. Do you need technical services? Send us your specs, we're happy to help.